Happy Thanksgiving to you and yours!! I hope everyone has enjoyed a wonderful meal with people they are thankful for today. I am resting in a room of my sleeping family members and dogs right now and nothing makes my heart feel warmer. Last year was my first year being able to decorate a place of my own so when I started to get all of my decorations I went with a metallic theme and included a lot of non traditional colors. My wreath brings out most of the colors from my tree and other decor. I recruited my friend Brittany last weekend to undertake round 2 of this project with me! 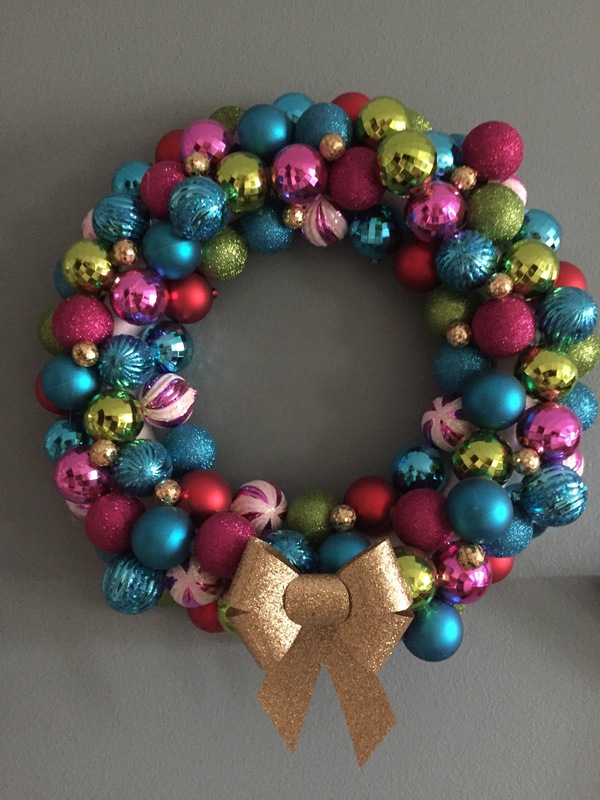 I wanted to make an ornament wreath for my mom because she has the perfect spot above the fireplace at my mom and dad’s house to hang a big wreath. 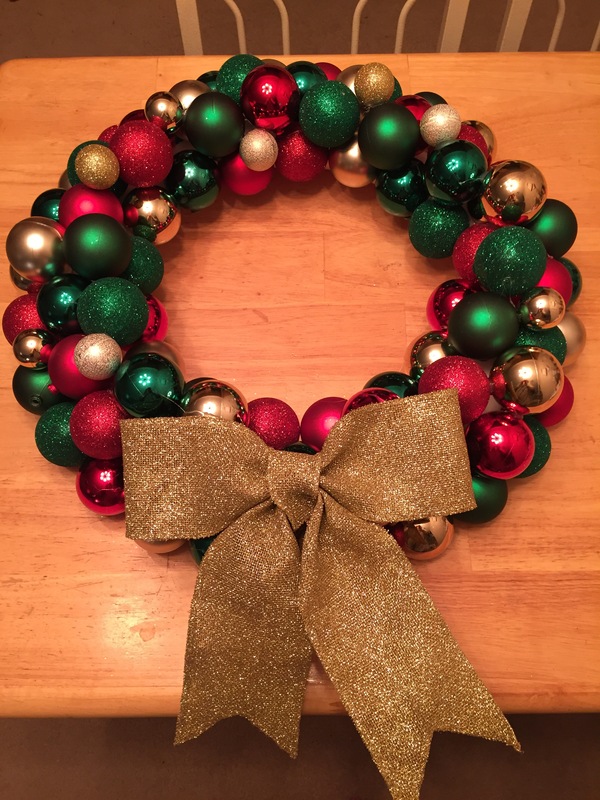 My mom’s decorations are much more traditional colors so I made her wreath with green, red, and gold. – Styrofoam wreath form in any size of your choosing. You can find these at any craft store and they are very inexpensive. I got my large sized one this year for $7! – Ornaments and any other decor of your choosing! I used a bow on each of mine as well as some smaller than standard ornaments to mix in and add variety. **In order to create a large sized wreath I needed about 85-90 ornaments. 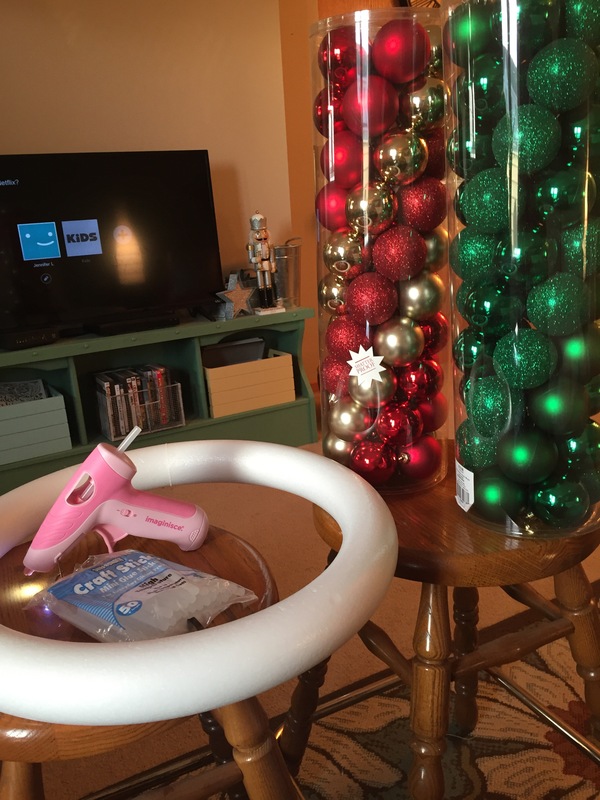 Typically the large “towers” of ornaments you can buy will have 50 in each so I went through almost 2 towers! My recommendation is to remove the cap/hooks from your ornaments before you glue them. They very easily pull off. I started with my gluing on the outside edge of the wreath being careful to glue so that the caps of the ornaments aren’t showing. After you’ve finished your outside edge it’s really anything goes! That’s the beauty of the project….there aren’t many rules or steps to follow 🙂 you can make as many layers as you’d like and just fill in as you go, using the different colors strategically so that you spread them out evenly. Here is the finished product for my mom! I am excited for her to hang it up at home when she does her decorating so I can see it in its place above the fireplace! Enjoy the rest of your day with family and I will be back soon with a post about the rest of my Christmas decorating! I had the exciting opportunity to support a local entrepreneur this week and it is so exciting!!! B.Mesi headbands is a brand new adventure by Jess Seay, a Grand Forks resident and busy mom of three. She (like myself and many other women!) found herself buying more and more headbands but not always being impressed with the prices and selections at other stores….so she decided to fix it by making her own!! Now, with B.Mesi she is making great headbands from her home with a fun variety of patterned fabrics that will make getting your hair ready for the day a snap 🙂 The prices are incredible (only $4 per headband for most fabrics…WOOHOO!!) and she also makes kids sizes to be able to dress up and accessorize your favorite little girls in your life, too. I picked up my order of 3 headbands yesterday morning and I wore the gray arrow print yesterday and am wearing the gold shimmer today. I can personally attest that they do NOT slide off of your head…which for me is always the most frustrating thing about headbands. They are also very wide so can hold back lots of hair or you can scrunch them down to make them smaller. It’s also nice to spread them all the way out and cover the tops of your ears to keep them warm now that the colder weather has arrived! Already in love with the Gold Shimmer pattern….I know this one will get lots of use!! I hope you all are having a wonderful weekend; and as always, thanks for reading! My first few months as a homeowner have inspired the full adult in me and I thought that this year would be a great “first year” to send a Christmas card to my family and friends. Luna the goldendoodle and I are a nice little family and I knew it would be a great way to get my address out to my family and close friends since I have moved. Growing up, it used to be one of my favorite things to take down the banner on the wall where my mom put all of the Christmas cards we received in the mail and go through and look at all of the family photos and read the witty, smart Christmas letter that family and friends would send. It truly is a way to send your joy and cheer to others. My mom, who is an excellent photographer, helped me out in the photo department and took some fantastic photos of me and Luna back behind my mom and dad’s house about a month ago when the trees and leaves were at peak time for beautiful fall colors. They have a nice path that is lined with trees along the coulee. It was definitely difficult, but we managed to get a handful of great snapshots of both me AND Luna….getting her to look at the camera was far from easy. In the past, I have used Shutterfly for lots of different photos projects including calendars and photo books for different family members or occasions. Their website is very user-friendly and they have countless design options to pick from when it comes to font, color, and layout. I have been keeping a close eye out for a great deal on their Christmas cards and today I found it! I won’t share any sneak peeks of the Christmas card since I don’t want to spoil it for anyone who will be receiving it but once they are sent out I will try to include a picture in one of my posts as we get closer to Christmas and I start showing all of you my decorations!!! I haven’t been able to resist putting some things up around the house and my outside lights but I am using all of my strength to keep my tree put away until the day after Thanksgiving. 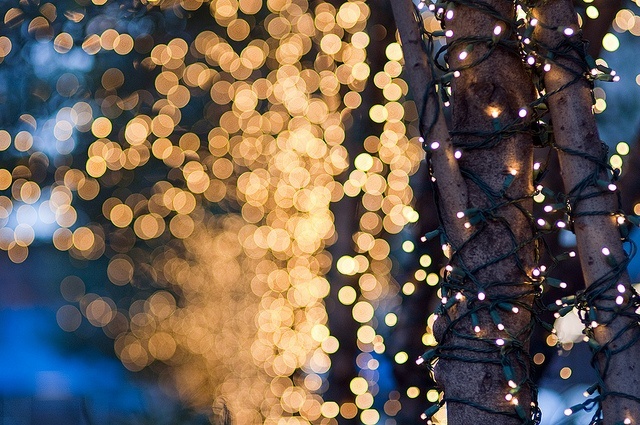 I hope all of you are starting to feel the magic of this season of Thanksgiving and Christmas. It sounds like the snow is making it’s way here this weekend….call me crazy but I’m excited. There is something so magical and special about the first snow of the year. I hope you all had a wonderful Monday and I will be back soon! scarf season is in full swing! Even though the past couple of days have been beautiful temperatures there is no doubting that fall has officially moved in. With chilly fall weather comes all of the great clothing along with it: especially scarves!! Similar to my large pile of leggings, I have quite the collection of scarves. All colors, patterns, weights, and styles. In order to save some money on my quest for more scarves a couple of years ago I decided to try making my own. I have extremely minimal skills in the sewing/crocheting department but I heard about arm knitting and that it required no previous experience or any type of supplies other than yarn. The first night I attempted to arm knit I watched this exact YouTube video over and over and OVER again. It is less than 12 minutes long and walks you through each step of the process. The only supplies you to need to make the first scarf of your own is two skeins of yarn. Here is a photo of the 4 skeins I bought earlier this fall at Hobby Lobby. Both sets of skeins I bought are a weight of “7” and have lengths of 42-45 yards which you can see on the picture I took up close of the label. In total I have now made more than a dozen scarves of my own! Some I kept and many I have given as gifts to friends or family. Here is a photo of some of the scarves I have made and kept. As I mentioned before, arm knitting is great because you can use yarn of different weights, patterns, and materials.I have experimented with different types and like all of them for different reasons. Heavier/bulkier yarns are great for thicker scarves to wear outside with your jacket. Lighter and thinner yarns are good to use for scarves that you plan to wear inside and won’t be too warm to be wear all day. I am sitting down right now (after I publish this post!) to make my first scarf of the year. To get me in the spirit I put on my favorite scarf I made from last year in mustard yellow and it looks like I won’t be quite able to get started knitting because Luna is resting on one of my skeins of yarn. Apparently they can double as a pillow! If anyone reading this post would like to learn how to make an arm knit scarf of their own I would be happy to have you over and we can work on one together. Or if you would like to pick a color of yarn and have me make it for you I would be more than happy to 🙂 I have considered buying a large amount of yarn and making a bunch of scarves and putting them up for sale on Facebook/through my blog. If you would be interested in buying let me know!! I hope everyone is having a great week 🙂 See you again soon! Thanks so much for reading!